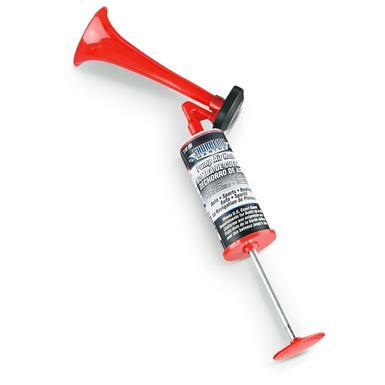 Shoreline Marine Pump Air Horn, 11 oz. Let 'em know you're coming through! Trust me, they'll hear you. Easy-to-use Air Horn is a must for all marine applications. But unlike "canned" horns that are only good for a few decent blasts before sputtering out, this Horn from Shoreline Marine will NEVER "go flat." That's because the air is supplied by you , instead of a sealed aerosol container. Just depress the plunger at the base, and let loose with an unmistakable "comin' through" that's impossible to miss. It's also easier on the environment! Note: Pump Air Horn is very loud. Always aim away from yourself and others when operating, and use hearing protection when necessary. Colors may vary. Sorry, no choice. Shoreline Marine Pump Air Horn, 11 oz. is rated 4.8 out of 5 by 80. Rated 3 out of 5 by ezmark from Squeeky!! Not as loud as I anticipated and a higher pitch. Rated 5 out of 5 by Moondog from Good product I ordered this to keep in our safe place in the basement. If our house caves in around us in a storm, this product should make enough noise to let anyone near know we are alive. I would recommend this to anyone. Rated 5 out of 5 by Bibeau from good deal Very loud I really like it . Rated 5 out of 5 by snow white from great value!!! !puchased 6 no rechrg.GREAT gift every household with children should have at least one.they cant say they did not hear you . Rated 5 out of 5 by IMREM from NICE LOUD HORN! As advertised, this horn is quite loud. My wife is an extremely sound sleeper, which makes it very difficult to wake her up. Well, this horn does the trick! !